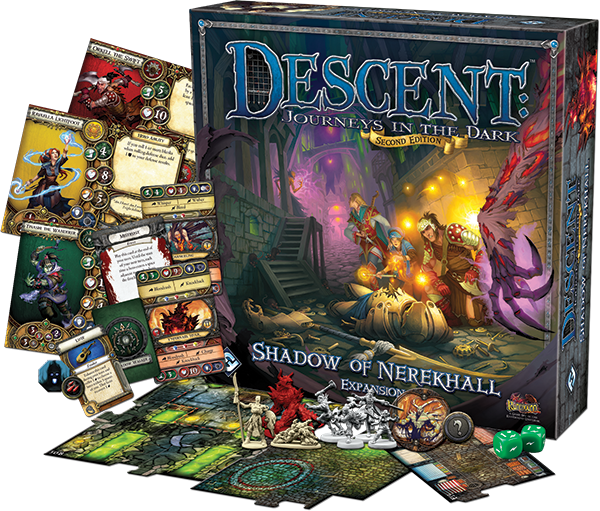 Shadow of Nerekhall is an expansion for Descent: Journeys in the Dark Second Edition. You and your fellow heroes travel to Nerekhall, a thriving town with an evil reputation, where you must determine whether the shadow of the past has truly vanished. There, you’ll find unnatural events occur almost daily, but are outside forces infiltrating the city, or is the city itself rotten to the core? The Shadow of Nerekhall expansion relates a riveting story, divided into nineteen new quests that you can play individually or string together in a campaign. Along the way, you’ll encounter deadly monsters and traps. Fortunately, four new heroes offer their services, bringing powerful new items and a new class for each hero archetype. With this new expansion, it’s up to you to uncover the truth behind the walls of Nerekhall.